I am thinking of doing a few of these for Christmas! I know! Me too. One of my sisters just gave me one with ice cream toppings and cheese and crackers though, so I can’t complain too much. 🙂 I’m making some myself. Thanks for stopping by. I love the gift basket idea and I know the movie one is always a big hit! I have made “spa” baskets for my kids’ teachers before–everything from the dollar store–hooray! Yes, gift baskets on a budget are a blast! There are so many options. Thanks for stopping by. I love this idea! I really enjoy making baskets like this, but now I have a couple more to try! Thanks for sharing. 🙂 Hopping over from A Mama’s Story! They are such a fun gift! And the options really are endless. Thanks for coming over! There are great ideas here! Pre-bought baskets and hampers can be so expensive – these DIY ones are a great way of saving money and adding a personal touch. So true – you can personalize them to your recipients tastes (and find things on sale or buy in bulk if you are making several). I love your ideas! I will pin this post. I found your post through Mommy on Demand’s link-up. I also do a Bloggers Brags Pinterest Party on Mondays! Would love to see you link up there! Thanks! I love gift baskets – they are so much fun. How fun! I’ll check out your party. Thanks for stopping by. Thank you for linking up with us this week for MMM link up party! I appreciate you coming every week! I LOVE these ideas!! I have some people who I need to get something for and these have given me some great ideas!! I hope you have a great week this week. Ill be sharing this on the FB page this week becasue I know others are looking for great ideas too! Thanks for hosting. It’s always fun to check out all of the links. 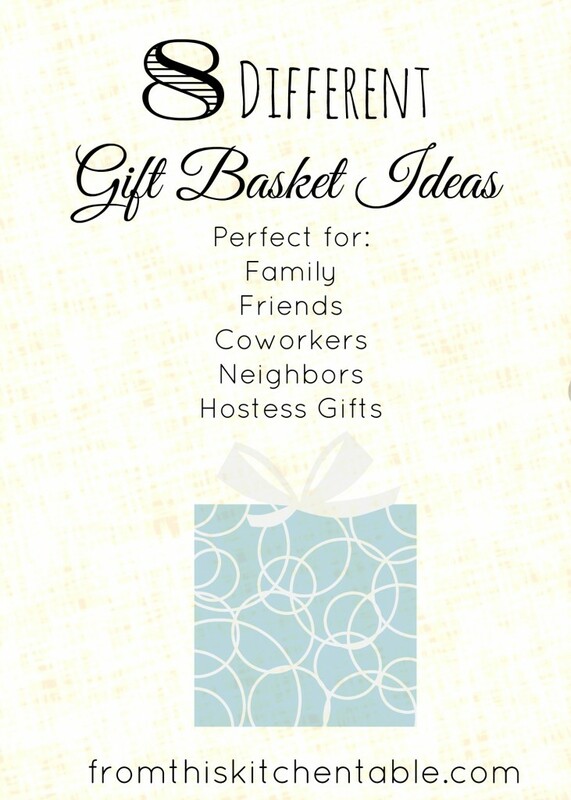 Gift baskets are fun and so customizable! My sister did one with ice cream toppings and cheese and crackers. Yummy! You have a great week as well. Loving this! Pinning it so I can do this for Christmas. Visiting from THE Pin Party! Thanks! I’m using some of them for presents too. Love that they are all practical and consumable – no presents that will just take up space and not get used. Thanks for stopping by. These are fantastic ideas! Thanks for sharing these. I already have some friends in mind to make baskets for. These are also great for my girls to do! Thanks and you are welcome! Love gift baskets. I’m making several too for family and staff parties. Love the idea of getting your girls involved. I think even my almost 3 year old would love to help assemble and feel a part. What fantastic ideas, just pinned to my gift ideas board. Thanks for sharing on the weekend re-Treat link party! Thanks and thanks for pinning! I appreciate it. Enjoy The Weekend re-Treat party! Have a great weekend. Awesome ideas! 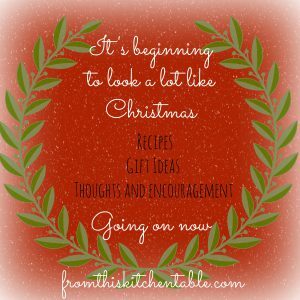 I’m baking treats later this week to take to our neighbors, so I may integrate some of your ideas to make gift baskets for each household.